This morning I found Nocty, one of our younger Ameraucanas (she would have been a year old in April), dead in the coop. She was lying in the narrow space between the roost and the big door. It couldn’t have happened long ago. Her blue egg was next to her, still somewhat warm. There was no blood or anything on her, and she didn’t freeze. There had been no symptoms, on the contrary, she was the energetic one, and she was regularly laying eggs. I think it may have been Sudden Death Syndrome, aka heart attack. I hope so, because I wouldn’t want there to be a disease in the coop. Everyone else seems fine, but then again, so did Nocty. I was shocked and sad to see this sociable, sweet and funny chicken lying there so vulnerable and – I think this is what got me the most – so alone. She is still a beautiful chicken and I held her like she let herself be held in life, like a baby. Hardest of all is the realization that Amie will take it badly. 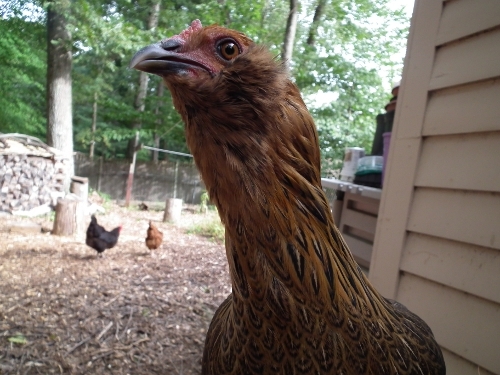 Another issue is Nocty’s “sister” Oreo, who is at the bottom of the pecking order and who always found refuge with Nocty, who often pecked back at the four older hens. It’s the first chicken we’ve lost, indeed the first pet (that’s how Amie thinks of her). I’m getting ready to tell Amie after she comes home and after her play date – which means I’ll need to keep mum the whole time they play. For once I hope it rains and they can’t go play outside, with the chickens.